This clematis care guide includes tips for growing these beautiful, flowering, perennial vines. Find out what type you have, if it needs pruning, how to propagate, when to transplant, and how to get lots of blooms. If you love clematis vines the way I do, you will want to grow a lot of them. And, as lovely as they can be, they can be rather delicate in the garden. 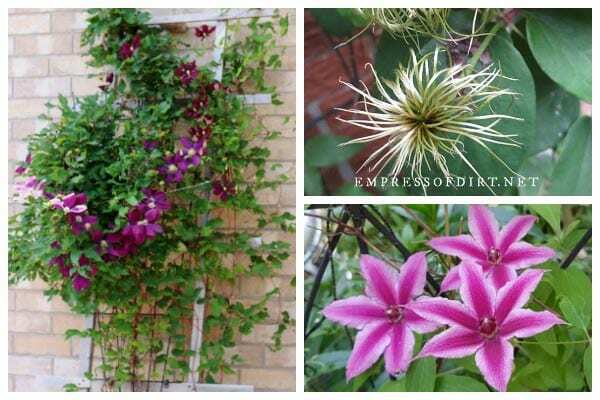 This will show you how to care for clematis vine with the best tips I know for long-living, healthy vines that produce an abundance of flowers. Clematis (pronounced clem-atis) is within the buttercup family, Ranunculaceae, with about 300 species and many more hybrids with an array of different shapes, colours, and characteristics. Most are hardy to USDA zones 4 to 9. Best planting time: spring, after the risk of frost has passed. Sun: 6 hours a day. Size: varies from 2 to 30 meters in length. Moisture: never allow to dry out or stay soggy. Winter: a cool, dormant rest period is beneficial. Long-blooming flowers with sizes varying from small to very large (a few inches to a foot in diameter), depending on variety. Manageable plant: lightweight, never thuggish if appropriate for your climate. Scents: an array of interesting fragrances from the flowers. Beautiful seed heads at end of season. Can grow on trellis, shrubs, up trees, or horizontally across rocks or garden beds. Can propagate new plants from seeds, cuttings, and by layering method. Delicate stems are easily bent and broken. Lepidoptera caterpillars eat the leaves. But, hey, it’s the circle of life. Japanese beetles will eat the flowers. Fungal disease can strike suddenly and kill the plant or reduce it to the soil until next year. Left alone, the stalks can grow into quite a tangled mess. Newly-planted vines may not bloom for a few years. You will always do well if you choose the right plant for the right place. 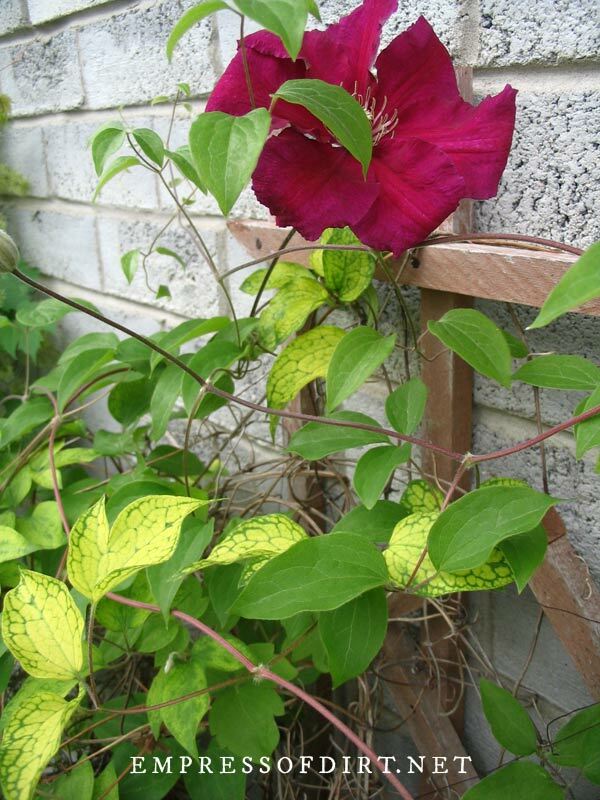 Be sure your clematis is suited to your growing zone and not considered invasive in your area. The right location meets the needs of the vine. Most clematis like full sun locations with at least six hours of sun per day. The site should have well-draining, fertile soil with room for the roots to spread without direct competition from other plants. Because clematis will not tolerate drying out (they’ll die), watch out for hot spots in your garden. Sometimes planting next to a wall that reflects heat is enough to overheat and dry out the soil. If you choose a spot like that, be on water patrol during the warmer months. Be sure your clematis vines have something to grab onto. Before you plant, you need to think of how you want to train the plant. Clematis can grow up trellis, across the ground, and along other plants like shrubs or trees, so long as the roots are not directly competing. It’s good to get the trellis in place before planting because any adjustments later can hurt the plant—it’s those darn tiny tendrils that bend and break so easily. Your vine will likely need your guidance to grow in a pleasing way. The tendrils wrap around anything they encounter but without support immediately available, they will wrap around themselves. The supports on most trellis can be too big for the wee tendrils, and additional support with twine—for every six inches of growth—may be needed. Some people also use mesh or fishing line against a trellis, but I find this can get the plant tangled in a way that can’t be undone. 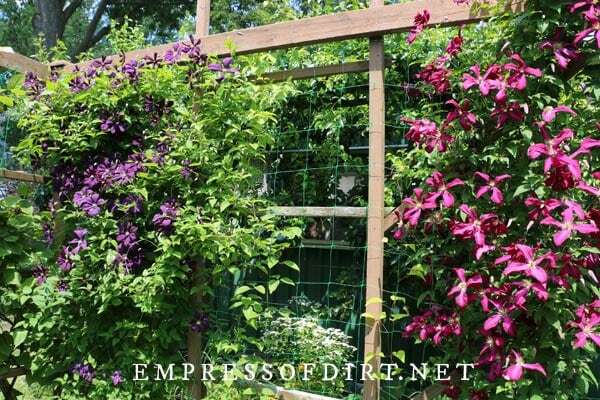 Read more here: Tips for Choosing the Right Clematis Trellis. If you have purchased an established vine that comes in a pot with a small support trellis, planting can be a two-person job. All those stems and tendrils are delicate and easy to break simply by bending. It may be necessary to snip off some of the stems simply to detach it from the trellis. Before planting, you can root-wash the roots of the clematis. This involves soaking the root ball in a container of warm water, and gently coaxing the original growing medium away, which becomes too dry in the garden. Root-washing requires some care, but it gives the plant a better start. 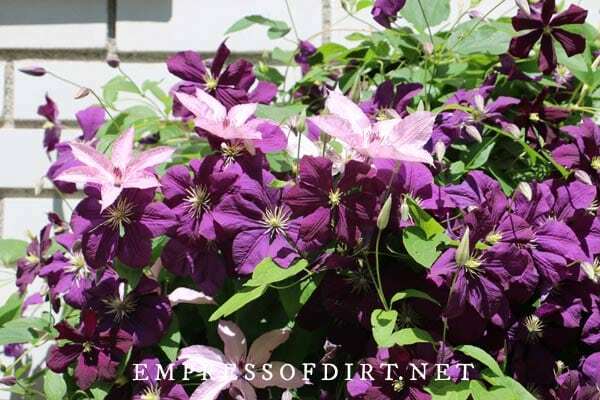 There are varying opinions about the right depth to plant clematis. Recently, I notice many clematis enthusiasts suggesting planting deeply, with some of the crown, where the roots meet the stem, about six inches below soil level. Apparently, the stem will grow additional roots underground when planted this way. The idea is that deep planting will provide extra protection against wilting diseases which cannot penetrate parts of the plant underground. I’ve always planted mine at the same depth they were in the pot when I got them, but I’m definitely going to give this a try. The planting hole should be just deep enough for the roots (and any length of stem) you are burying. The hole should be just as wide as the roots when fanned out horizontally. Again, handle with care. The roots are the most sensitive part of the plant and vital to its growth. This has smart tips for getting started: 8 Best Tips for Growing Clematis. Yes, you can grow clematis vine in containers. Choose a large pot, fill it with a combination of compost and organic container mix suitable for flowering plants, free of synthetic fertilizers or moisture beads, so instead you can control the growing conditions. It is recommended that you choose a variety that is suitable for one zone lower than yours as container growing exposes it to harsher conditions. Methods for keeping potted clematis over the winter are the same as we overwinter hardy potted trees. Read more here: How to Overwinter Potted Trees in a Cold Climate. Check your clematis daily to ensure the soil stays moist, not dry or damp. While many new plants need attentive watering for the first year after planting, you may need to watch your clematis for its entire life. They just cannot cope with dry soil, so make it a habit to check the moisture levels often. Always water the soil, not the plant. Don’t just trust your eye on hot days. Either press your finger tip into the soil, at least knuckle-deep or use a moisture meter to check if water is needed. If you’re going to be away, this has ideas for setting up a self-watering garden system. Your clematis may have come with specific instructions for fertilizing. I like to create compost from kitchen waste and use that to enrich the soil. Some suggest giving young plants a feed of liquid fertilizer every six weeks or so. Established plants, like the big purple Clematis Jackmanii can have a slow-release feed each spring and fall. If fertilizers are warranted, organic slow-release fertilizers are my top pick. When should I prune my clematis? There are a few things to know first before you reach for the pruners. All clematis can be pruned to remove dead, damaged, or diseased branches at any time, but beyond that, you need to know what type you have to make any other pruning decisions. Pruning at the wrong time or the wrong plant can set back flowering for a year or more, so hold your horses with the pruners. See Types of Clematis and How to Identify Yours to figure out your pruning group. Bloom in spring on old wood and do not require pruning to trigger future flowering. Bloom in early summer, first on old wood, then on new wood, and can be pruned after flowering. Bloom in late summer on new wood. This is the one group we cut down each winter, anywhere from 6 to 24 inches, depending on the maturity of the plant. There are five basic reasons why a clematis vine may not flower. Improper pruning: Sometimes we are so eager to prune, we don’t realize we’ve cut off the emerging flower buds. Nutrient Imbalance: Over-fertilizing is one possibility. If the vine has lots of green growth but no flowers, it could be nitrogen overload. Alternately, the soil could be lacking key nutrients. The only way to know for sure is to get a soil test from an accredited lab who can tell you what your soil needs. One recommended fertilizer for clematis is Espoma Rose and Flower Food (4-3-2), which is an organic, slow-release fertilizer. Inadequate light: Many clematis will grow fine in partial shade but can’t produce blooms without full sun. Too Young: Some clematis bloom in their first year, others may take up to five years to produce their first flowers. It’s a little annoying for us flower-centric gardeners because we don’t know if they ever will! Bad Plant: Sometimes, it’s the plant. There are duds that just never want to bloom. 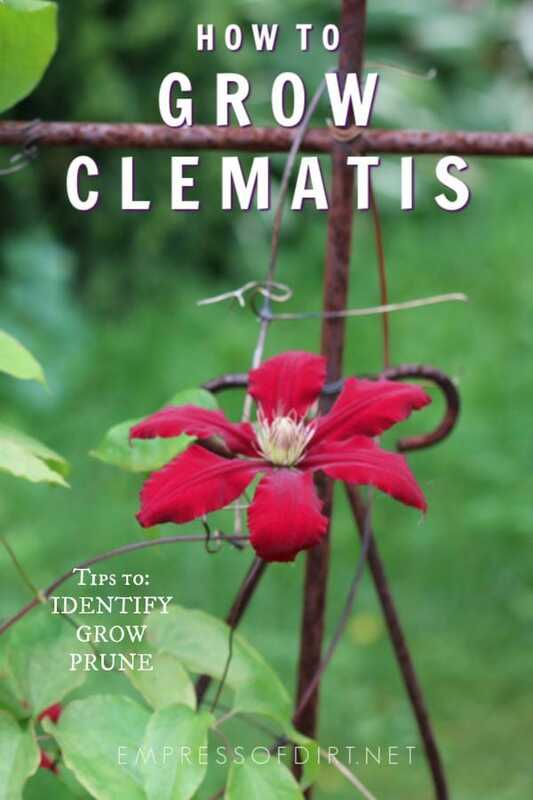 See Why Your Clematis is not Blooming and How to Get it to Flower for more tips. There are a few ways to grow new clematis plants from the ones you have. Growing clematis from seed is a long, slow process. Germination can take anywhere from six months to 3 years. The one time I had success, I had actually given up and set the potting mix aside. It stayed moist in the shed and a year later I found it sprouting! So, it does work, of course, but it is for patient humans. After several years of good growth, clematis can be divided and transplanted, where you carefully split the roots into several smaller vines. Be a careful surgeon, though, and operate under the right conditions (moist soil, healthy plant) so you do minimal damage and win the free plant lotto. Growing clematis from cuttings is my preferred method. There are a few ways to do it, but basically you take green stems, prepare them, and place them in potting mix where they will need humidity until they are securely rooted. This has step-by-step instructions: How to Grow Clematis from Cuttings. Another method of propagation is layering. Part of a stem on a living plant is pinned under the garden soil and kept there until it grows enough roots to be separated from the mother plant. Grafting is also possible, with the clematis vine grows from a different base plant, in case you want to explore more sophisticated propagation methods. From what I understand though, the heartiest clematis vines are growing from their own roots. There are a few diseases that infect or kill clematis vines. Damp growing seasons where rain water splashes pathogens onto plants can be the culprit. As you’ll see, some of them have the most delightful names (I’m kidding, they’re gross). Leaf spot (there are at least ten types) appears as large spots on the leaves. Powdery mildew (Erysiphe aquilegiae) shows up as white stuff on the leaves, same as it does for other plants. Rusts (3 different types) appear as little yellow spores embedded in the leaves. Root rot starts below the soil level, causing the plant to wilt and die. Tomato ringspot virus causes mottled yellow leaves. There’s also Botrytis Grey Mould, Slime Flux (a soil-born bacteria), and more. Clematis wilt is the one I see most. This could be Phoma dematidina or Coniothyrium dematidis-rectae. They are take-no-prisoners, fast-acting fungal diseases. One day the plant looks fine and the next day it’s blackened, withered as the stems collapse, and standing at death’s door. If you do get the wilt, there are fungicides to treat it, which can be effective if caught in time. This is another good reason to inspect your clematis vines daily. When I notice fungal wilt, I cut the vine back to where it still looks healthy. Sometimes I have to cut it right down to the ground. It’s also recommended to put a protective collar around the base of the plant to further shield it. For the other diseases, treatments vary. Best to take photos, get the problem correctly identified, and go to a trusted nursery for their suggestions. Also, some of these troublemakers continue living in the soil, so there may be some precautions necessary to nip ‘em in the bud. Just like other herbaceous plants and deciduous trees, come fall, clematis leaves change colour and drop off. Some late-blooming varieties like Sweet Autumn Clematis, which is invasive in some areas, and Clematis virginiana may sneak in some flowers right until frosts begin. Green stems will die in the winter; the older woody stems will survive. Watch out for hungry wildlife in the winter: sometimes this is the only food available and they’ll eat the woody stems. In winter or early spring, we can cut back our Group 3 clematis, leaving a foot or so that will send up new shoots as the weather begins to warm again. A two-inch later of mulch around the root area, not directly touching the stem, will help insulate the soil. Clematis in containers can be protected in a sheletered space that does not drop below freezing. 1 Can I cut back my clematis now? You can remove dead, damaged, or diseased parts at any time. Otherwise, the very general rule is: only prune after flowering and before buds have formed, unless you want to give up a chance of flowering for the next growing cycle. That said, only Group 3 clematis need cutting back in winter or early spring. Pruning is not required for Groups 1 and 2 to grow and flower. There is more information here: how to find your pruning group and when to prune. 2 What to do with clematis after flowering? If you’re wondering if you should prune your clematis vine after it flowers, it is best to first know which type you are growing (Group 1, 2, or 3) and then decide. Most clematis do not need any special care at this time. 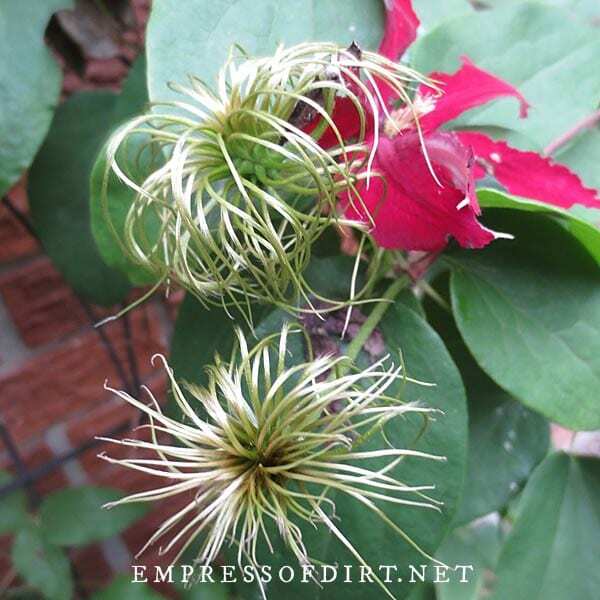 After flowering, clematis vines produce seeds. Many gardeners love these seed pods as much as the flowers because of their beauty and interesting spiral shapes. These seeds can be saved for germination. 3 How do you overwinter clematis? If your vine is suited to your growing zone, no special treatment is required to be winter hardy. In winter or early spring, Group 3 clematis, which includes the popular Jackmanii, can be trimmed down to 6 to 24-inches tall, depending on the maturity and size of the plant (leave more for older ones, less for younger ones). The encourages new growth in this type of clematis. I’ve had hungry rabbits eat anything in my garden at nibbling height in the winter. If you have creatures like this, you could put a protective collar around the base of the plant (surrounding but not touching it). 4 Does clematis like sun or shade? Most clematis like full sun and will also grow in partial shade. If the shade is too much, the vine may not flower. There are more growing tips here: clematis growing tips and care. There you go! If you have any questions, bring ’em on. Melissa, thank you for all your information. I managed to root deciduous clematis by fall, although there has been no new top growth. I brought them in to the house for winter, and gradually all the leaves have died and fallen off. No sign of fungus, not too wet, etc. Am I to assume there will be growth in spring, and that the leaves are gone because they are deciduous? Hi Susan, It’s really hard to tell because there could be so many things affecting it. Also, I’m not familiar with keeping clematis indoors. You could check to see if the roots are still going. My plant was looking beautiful. Just planted it this spring. use to eliminate the bugs?! There’s lots of possible insects. I don’t have info here but you can google ‘insects that eat clematis’ to find out what it could be. The solution is often not to go after the insect but learn what conditions attracted it to the plant and change things that way. My clematis is dy at the bottom (6″). It still grows and blooms. Should I build up more dirt around bottom or just mulch? Is it dry at the base or just turning woody? It’s normal for clematis to get woody (brown) as it ages. Separately, mulch is always a good idea to protect and enrich soil. What guidelines would you give for the size of pot you’d want to use for a gallon plant? What do you do in the winter time – can you leave plant and pot outdoors? I would choose a pot about 4″ maximum larger in diameter than current one. No, you can’t leave plant outdoors. Choose a sheltered location where it can be kept dormant and just above zero freezing. This article on storing potted fig trees for the winter describes the same process for overwintering a potted clematis. I have a clematis in a pot for about 3 yrs now. It never gets any bigger, just one thin stem about 2 ft tall with one bloom (2″ purple flower in June). I’ve tried cutting it back and repotting it and roots keep getting bigger but not the plant. Should i trim the roots (how much). I have others that do fine. Any suggestions? Is it a good, strong plant? Some just aren’t…. Did you use good potting mix? Is it time to repot and replace the mix? Does it like the type of pot? Plastic is better than clay or ceramic for retaining moisture. Does the plant like its location? Is it a clematis that is okay with being a pot or would it prefer in-ground? What growing zone are these tips for? I’m in zone 8a. A lot of my spring flowers blooming before June. The ‘if it blooms before June, don’t prune’ is an old saying but does prove helpful as a spring garden clean up tip for any 4-season gardener. Anything that blooms early should be left alone in spring until the flowers have come and gone. I think I have a Nelly Moser, I’m not sure. My Mom gave it to me, she’s forgotten what it is. It usually blooms around April- May. I’ve been cutting it back to about 4″ from the ground. At a strong pair of leaves in February.It usually does well with that.Is there a way to send you a picture of it? I have another one that’s not doing as well. I’ll apply your “bloom before June” to it. My favorite plant.Trying this.Live in zone 3 so do not know how it will winter.My main plants are 20 years old and do very well.So showey. My clematis bloomed this spring. Now all I have are vines with spent blooms, the fuzzy centers. Will it bloom morw? First, make sure the type of clematis is appropriate for your growing zone. I have no experience with a climate like yours but I have had other people from there say they have the same struggle. I always suggest growing the clematis in a pot so you can control the soil and water and move it around as needed to find its favorite location. I do not use fertilizer or coffee grounds, just good soil with compost. mine bloomed for two years and then just died why?